Community Weaver 3 Has Arrived! 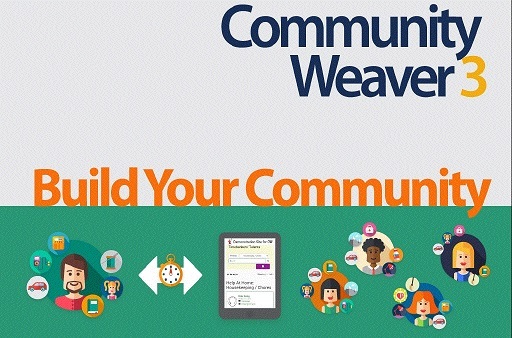 Final testing for Community Weaver 3 is finished!Â A presentation of the new and exciting features is available HERE you can now see the new Demo site. Community Weaver 3 is streamlined, smart, and nimble. Members will love the simplicity and responsiveness of their pages, will find it all at the click of a mouse, and they can quickly get down to building community in earnest. We are already getting rave reviews from our test sites in Media, PA and NOLA TB in Louisiana, and we are gearing up for a smooth transition for TBâ€™s ready for the switch. We hope you take a moment to check out the DEMO, so you can see why weâ€™re so excited! Like all Timebanking endeavors, it has been a labor of love, streaming from the hearts of coordinators who stepped up to give their honest and passionate input and their ultimate wisdom from the field. TimeBanks USA teamed these leaders with software developer Kent Davidson, who created CW 3 with the stability and adaptability to propel the Timebank Movement forward into our bright future. We are so excited that CW 3 is now a reality! We couldnâ€™t have done it without the vision, knowledge and time of dedicated Timebank coordinators. Thank you, everyone, for your time and expertise! As coordinators, many of us have benefited from pioneers before us and felt a desire to pay it forward to new Timebankers. We have keenly felt a love for Timebanking and a need for more gifts in our world. That need led to the Timebank Knowledge Commons and the conscious efforts of many Timebankers coming from all over the world to gather in collaboration. This spiral of giving always pushes us to expand our hearts and minds ever-outward, from our street, to our town, our state, our region, our country, and our planet. As we share Timebanking with newcomers, wherever they may be, love and gifts flow back to our streets and help every member to connect with more resources. We share a central vision of a peaceful world based on our conscious intent, and our tool for this is Community Weaver. Reciprocity is our survival and our path to sustainability, and it is based on trust. In the spirit of trust and the Gift, Community Weaver is our gift to Timebankers everywhere, and we offer it in the Gift Economy. Â You may give your time, your money, and your infectious enthusiasm in Reciprocity. In order for Community Weaver to succeed, we must remember that relationships take work. We may be used to someone else paying the costs of software development, lulling us into complacency and disconnection. Remember, we donâ€™t pay the actual cost of software development because we are paying in the myriad ways of capitalism, with intrusion into our website histories and cookies; we pay dearly in the loss of control over our lives. To take back trust and the Commons, we all must take responsibility for the whole and hold ourselves accountable for the change we want to see. As always, giving works better in circles. We have formed a support group, separate from the technical support we enjoy from TimeBanks USA, one with the intent of building a community of leaders who step up to assist and collaborate with all Timebank endeavors. Stay tuned for technical bulletins and supports from our technical coordinator, Eric Bachman! I was so excited when I learned that Community Weaver 2.0 was built on Drupal, Community Accounting, and other pre-existing pieces of free code software, built by open source communities. Because building CW 2.0 on their work was only possible because they made it a public commons using free software licenses like the GNU GPL, it seemed only natural that the small modules of custom software written specifically for CW 2.0 would be released as free code, in the spirit of reciprocity. I couldn’t agree more. I look forward to seeing TBUSA publish full documentation and source code for CW 3.0, under a free code license. I would recommend the GNU AGPLv3, which is intended for software used in servers running websites. Danyl, thanks for your comments. We too were excited to go open source. It seemed like an ideal way to go. Here is our story with that. Community Weaver is sophisticated, complex software. We were informed that using Drupal modules, it would be way easier to develop than it had been the first time round for CW1. After some 100 modules had been modified and then joined together in extremely complex ways; after 2 years; and after a cost that was six times the original estimate, we had OK software that users had sort-of adapted to. Jumping in to open source with all the idealism that we bring to timebanking, we learned — too late — about just how much investment in specification, coordination and management is required for the level of complexity that Community Weaver has. We also learned that Drupal 6 wasn’t really the right kind of platform for the product. (Drupal7 or 8 might be, but 6 was not.) We are not in the development community, we are the customers of the development community. What we learned –the hard way — was that open source works brilliantly under certain conditions. Ours was not one of those conditions. And Yes, we have used an open source underlying platform. And we hear you about giving back. Since we are not software developers, but rather, a software user, we give back where we can. We provide the software free to community timebanks that exist in the sharing economy. So far, almost 100 timebanks are receiving, without charge, the fruits of two years of work put in by our volunteer team of timebank coordinator advisors, our tech support person, and our developer. In short, we remain true to the ideals of timebanking and to open source — but in a larger sphere that goes beyond the confines of the development community. In closing this reply, I extend to you and all members of the development community an invitation to consider joining with us in “giving back” in ways that speak to the needs and possibilities of the world that stand outside development and to extend the notion of open source to include a more expansive view of what giving back could include. Our local Timebank totally failed to get traction, the committee all resigned one by one, and the project went into hibernation. But I don’t take that to mean that timebanking doesn’t work. It just means that particular attempt at timebanking didn’t work, and I’m looking forward to trying again sometime, with a different group, or in a different town. I understand that you had some teething problems with the CW2 development process, but with respect, it seems like you are blaming free code software and open source development for the failure of a particular company of contractors. Do you really think the same company would have delivered a robust service, within budget, if they had built CW2 from scratch using proprietary software? Of course not. If free code was not the problem, proprietary software is not the solution. It sounds like ncompetent contractors were the problem, and I’m glad you have found someone competent to replace them. I take it by "development community" you mean the software freedom /open source movements? I direct your attention to Indymedia, Wikipedia and the other WikiMedia projects, OpenSourceEcology, Appropedia, Loomio, OpenStreetMap, OpenFoodSource and OpenFoodNework, WikiHouse, WikiSpeed, WikiEducator Koha software for libraries, PLOS (Public Library of Science), FixMyStreet, and many, many more. All of these are built on free code, by members of the open source movements, to give back to social good projects and the public in general in a myriad of ways. With CommunityForge, timebanking is one of them. and CW3 could be too. You have already paid for the software, which means you have the right to choose how it's licensed, and whether or not the source code is available. All you need to do is instruct Kent to put all the source code used in CW3 into a public-facing repository, and put a free code license on it (again, I recommend AGPLv3). It won't cost him or you anything to do this. It just means that you are reciprocating to the software freedom/ open source movements, for what they have freely shared with you, enabling you to do what you're doing at a fraction of what it would cost if Kent had to build every tool he is using in CW3 from scratch. And yes, it would mean if some timebanks want to run CW3 on their owned or leased server, they could. Is this really too much to ask?